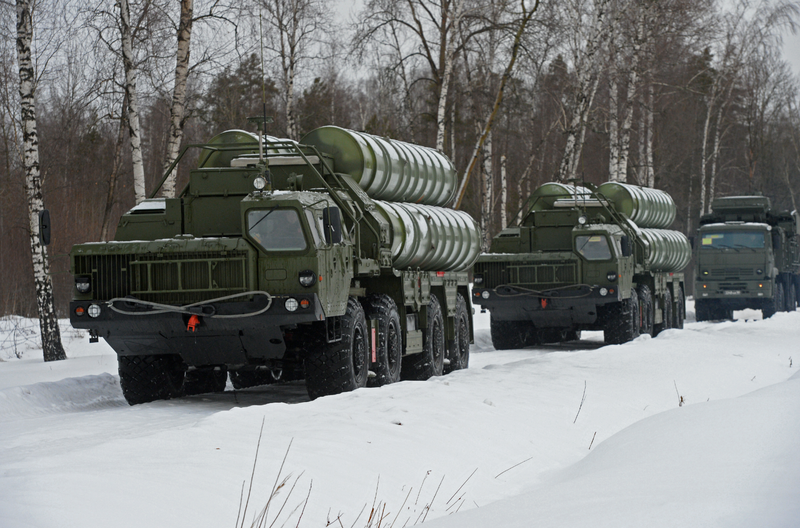 Launch units of SAM S-400 "Triumph" and self-propelled anti-aircraft missile and gun system "Pantsyr-S1", left to right, in the Moscow region. At the end of 2015, Indian media reported that the Defense Acquisition Council approved the purchase of the S-400 systems. The contract cost may reach $6 billion. Russia’s Federal Service for Military-Technical Cooperation (FSMTC) has prepared a draft agreement on the supply to India of the S-400 antiaircraft defense missile systems and now is awaiting a response from the partners, FSMTC deputy head Vladimir Drozhzhov told reporters on Tuesday. "The Federal Service has prepared a draft intergovernmental agreement on the supply of the S-400 systems to India and passed it to our partners, so we are awaiting a response," the official said at the Defexpo India 2016 exhibition. At the end of 2015, Indian media reported that the Indian government’s Defense Acquisition Council approved the purchase of the S-400 systems. According to the local press, the contract cost may reach 400 billion Indian rupees ($6 billion). S-400 Triumph (NATO reporting name: SA-21 Growler) is Russia’s newest long-range anti-aircraft missile system that went into service in 2007 and is designed to destroy aircraft, cruise and ballistic missiles, including medium-range missiles. The systems can also be used against ground objectives and can reportedly carry three different types of missiles. The S-400 range is 400 km. China has become the first international customer of Russia’s most advanced medium-and long-range antiaircraft missile system. In April 2015, China made an advance payment under a contract for the procurement of four to six Russian-made S-400 Triumph, Rostec CEO Sergei Chemezov told TASS then. Compared with the S-300 (SA-10 Grumble), the S-400 Triumph can destroy a much wider range of threats travelling at a speed of 4,800 m/s, e.g. intermediate-range ballistic missiles with a range of 3,000-3,500 km. It also can handle pinpoint targets and stealthy threats at a range extended by 50% owing to an increase in the power generation capabilities of the 91N6E radar system and 92N6E multirole radar. The introduction of advanced electronic countermeasures (ECM) resistance solutions has boosted the system’s ECM immunity by several times. Finally, its reliability has grown and its size and power consumption have dropped owing to its cutting-edge electronics, sophisticated self-contained power supply and advanced vehicles. The Defexpo India 2016 international exhibition is held in Quitol in the state of Goa in India on March 28-31. During the exhibition, the Russian arms exporter Rosoboronexport is planning to hold talks with Indian partners to discuss joint projects for the Indian Armed Forces’ further upgrade.